The Northwest neighborhood offers tree-lined streets, historic homes, and two waterfront view parks. Here is an environment where the sidewalks are never short of walkers and joggers, friends talking, and families on the move. It is a changing neighborhood that works at balancing the integrity of the past and the challenges of the future. 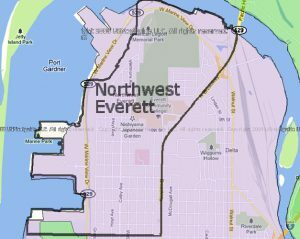 Everett is divided into 19 neighborhoods, each of which has its own neighborhood association. As independent entities, the neighborhood associations work to enhance their neighborhoods, support participation in city government, and foster a greater sense of community among Everett residents.